John Deere’s latest 5G Series speciality tractor line-up includes four model ranges featuring 3.2 and 4.5-litre Stage IIIA engines with a rated power of 75, 85 or 100hp (97/68/EC). This new series has been specifically designed to provide high levels of comfort, power, hydraulic performance and manoeuvrability to customers who operate in orchards and vineyards, or for other applications which require a narrow tread width. a twin pump hydraulic system with two mechanical SCVs, or a triple pump system with four electro-hydraulic SCVs including seven mid-mounted couplers. The open centre hydraulic system provides ample power, supplying up to 122.5 litres/min hydraulic flow when equipped with three pumps. For extra comfort and convenience, a joystick provides fingertip control of implements when using the electro-hydraulic SCV option. The tractors’ three-point hitch has a maximum lift capacity of 2590kg as standard, or with additional lift cylinders this can be increased to 3100kg. New push-button controls allow the hitch to be steered hydraulically from side to side, making it easier to operate rear-mounted implements in confined spaces. In addition, the operator can manually adjust the implement to keep it level to the ground, particularly when working on slopes. 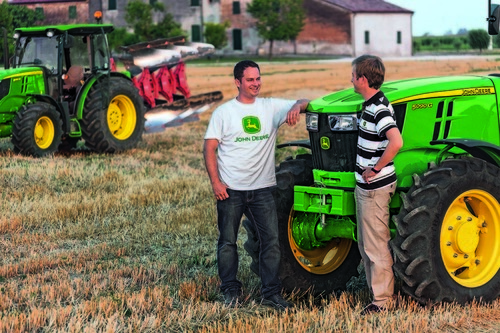 Completing the new John Deere line-up of speciality tractors for 2015, the low-profile 5GL Series 75 and 85hp four-wheel drive models feature an open operator station and a 24F/24R Sync Reverser mechanical Hi-Lo transmission, and are particularly suitable for pergola-style vineyard plantations.